How did you contribute the *last couple of months* to OpenStreetMap? : Neis One! How did you contribute the *last couple of months* to OpenStreetMap? 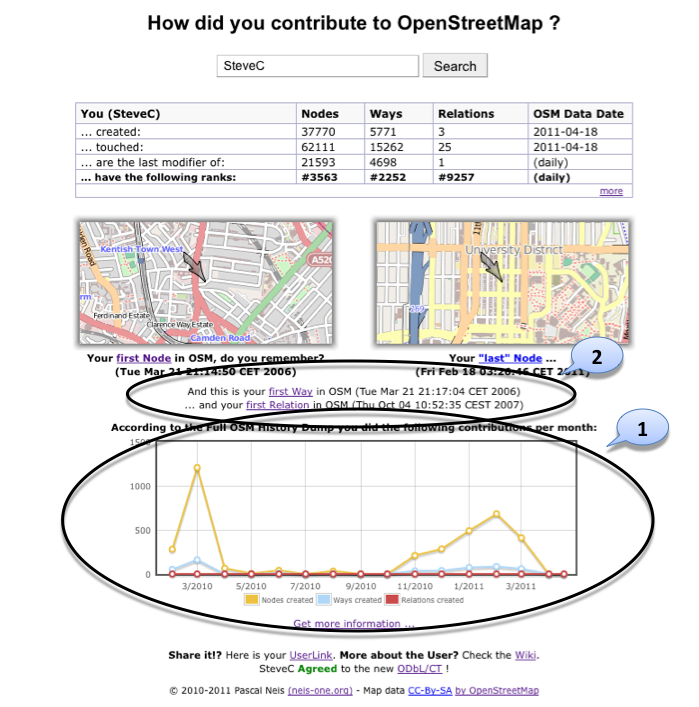 I think most of you know my website: “How did you contribute to OpenStreetMap?“. 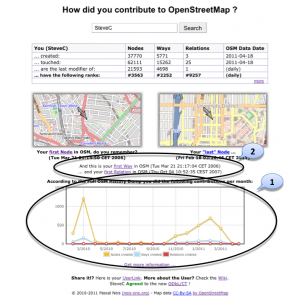 It is a website where you can find information about OpenStreetMap contributors. You can see the first/last node the contributor placed and the amount of created nodes, ways, relations and other things. Today I added a new diagram (1). It shows your monthly contributions to OpenStreetMap for the past 12 months as a chart and it’s based on the latest Full OSM History Planet Dump. In the following picture you can see the updates. By clicking at “Get more Information …” (below the chart) you can see your past contributions in more detail. Separated into different categories such as created, touched and your “last modifier” OSM objects (nodes, ways and relations). Very nice! Could you have a different axis scale for relations? Thanks! Loving this tool, however some parts of it are showing as last update “June 1st 2012”. Was this due to the licence change or is something broken? nope, it is because the last Full History Dump is from June 1st 🙁 . Anyway, I am working on a new version which will be independet of this file.